For ultra high performance in luminaries for lighting, horticulture and signage applications. Featuring a unique microcellular structure developed by Furukawa, MCPET offers unrivaled levels of diffuse reflectivity. As light enters the microcellular structure it bounces around the microscopic air bubbles before finally reflecting back at different angles, creating an ultra diffuse light reflection that is completely homogeneous. This technology was developed exclusively by Furukawa and produces incredible levels of diffuse reflectivity. In the case of our satin finish M4 grade the diffuse reflectivity is 100.8% when compared to BaSo4 Barium Sulphate. This is market leading performance. MCPET can improve luminaire performance by more than 30%, reduce energy consumption and glare by utilising highly efficient indirect lighting solutions. MCPET can be supplied in sheets in thicknesses ranging from 0.5mm to 1mm. The rigid properties of the material is something welcomes by designers, enabling a reduced number of components. Unlike cheap reflective films, MCPET can be used to secure wiring and will hold its shape without being fixed to another material, saving time and cost. MCPET can be supplied cut to customer requirements using state of the art Galvo lasers at super fast speeds. Parts can be supplied cut, folded and ready to install. Parts can be supplied with aluminium backing or 3M adhesive, reducing the number of suppliers required for luminaire production. MCPET is now leading the way for thermoformed reflective material. When 3D shapes are required and only the highest levels of diffuse reflectivity, MCPET is the only option. Furukawa supply thermoformed parts through our network of experienced converters. Use the contact us form to enquire for samples. M4 grade MCPET offers the highest levels of overall and diffuse reflectivity. The matt finish creates a homogeneous appearance, eliminating dark spots in luminaires and other applications. 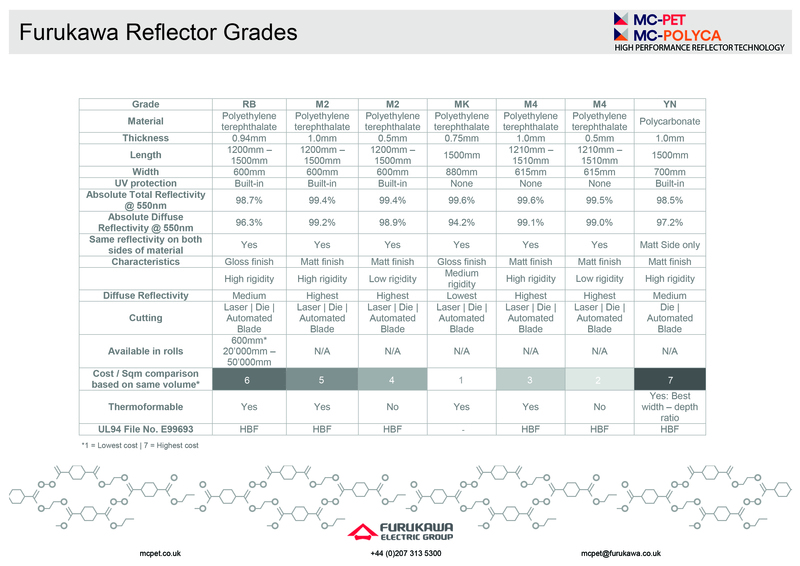 At over 100% reflectivity (compared to Barium Sulphate), MCPET M4 is the best performing reflector in the world. 1mm M4 grade benefits from the same high-level performance as 0.5mm, but is more suited to applications where increased rigidity is required. MCPET M4 grade can also be supplied thermoformed to achieve complex 3D shapes. RB grade is the most trusted reflector in the industry when it comes to performance and reliability. Used for many years by the world’s leading lighting designers and manufacturers, MCPET RB grade achieves 99% overall and 96% diffuse reflectivity. Available in 1mm thick sheets, RB grade can be supplied in a variety of shapes, thermoformed, laser cut or folded. M2 offers the same characteristics as our M4 grade, with added UV protection built in, making it the ideal solution for outdoor lighting where there is increased exposure to UV rays. M2 grade MCPET in 1mm is the ultimate reflector solution, where high levels of reflectivity, rigidity, thermoforming capabilities and UV protection is required. M2 offers the same matt, highly diffusive finish as M4. We can supply M2 in sheets, thermoformed or laser cut and/or folded to customer drawings. Developed specifically for thermoforming, MCPOLYCA is the best solution for thermoforming into complex 3D shapes. MCPOLYCA utilises the microcellular technology developed by Furukawa and incorporates this into a compliant polycarbonate. The most versatile choice.